It lets you group photos by metadata (e.g. “what lenses did I use with these photos?”) just like Lightroom's built in Library Grid Filter, but the plugin supports many more criteria. As of its initial release, the plugin provides 109 ways to slice and dice your photos, including things such as “Which photos have how much crop?” and “What photos are hidden within collapsed stacks?” and “What audio frame rates are seen in my videos?”. I started writing it a couple of weeks ago after first creating custom Lightroom camera-calibration profiles (mentioned in “Viewing Anthony’s New Shoes with My New X-Rite ColorChecker Passport”) because it was maddening to not be able to quickly identify what photos were using which camera profiles. and via the “isolate” buttons see the relevant photos. For reasons I can't quite understand, working on this plugin has been a deeply-intensive, morning-to-night affair, much to the detriment of my normal home and photo life. Perhaps it's because I particularly like data display, and it's a fun challenge to really make the plugin functional and useful and elegant (or, at least as elegant as Lightroom's minimal plugin infrastructure allows). There are a lot of bells and whistles... many little touches that hopefully most folks will never notice because they feel natural and intuitive, but a lot of work has gone into the details. I'm proud of the result. There are many more details and criteria on the to-do list, but I had to draw the line somewhere or I'd never get around to releasing the plugin, nor to returning to my regularly-scheduled life. I'm looking forward to a bit of the latter soon. Anthony's birthday party (10 years old!) is tomorrow. I am psyched to try this out. 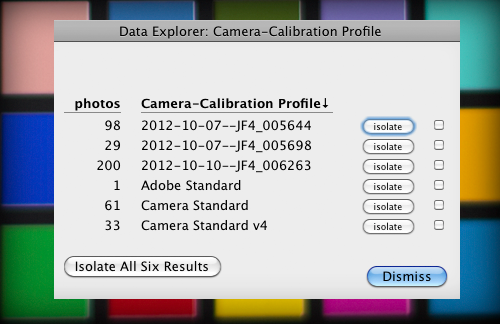 Lightroom’s stock metadata search bar is fine but this looks much more powerful and I love the idea of the “Isolate” button. Thanks for again pushing this software even further! Looks intriguing… have to give it a whirl! But it can’t compare to a ten-year-old’s birthday party by a long shot… Happy Birthday, Anthony!! 1. The ability to return to criteria choice dialogue from results, rather than having to entirely leave the plug-in and have to re-load it when you hit ‘dismiss’. 2. Could you add the criteria ‘using a lens correction profile’, even better, list all used. Thanks again for all the great work you do for Lightroom users. I may have missed this somewhere else on your site and/or in teh LR documentation, but is there a way to add the the EV info to the Grid view or somewhere? I don’t mean the EV compensation, but the EV as seen by the camera.